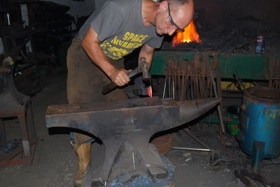 I have been working as a blacksmith for over 30 years and have lots of experience and anecdotes to share with participants over the course! I enjoy my career in metalworking, and making and creating products is a totally satisfying way to earn a living. I want to re-create this experience for everyone attending my courses – a real taste of a day in the life of a blacksmith! I was always driven by the desire to ‘make things’ – and on leaving school I started working at a local forge and learning the trade. I choose metal as a medium originally purely as it was more forgiving than wood, although I do enjoy working with wood too nowadays and have started a bit of side-line in sheds and summerhouses. I moved into industry later in my career and then set up my own forge at Standalone Farm in 1993 where I spend my time making things for home and industry. Over the years I have trained a number of apprentices and continued my own development at COSIRA courses – in particular focusing on traditional methods and techniques such as forge welding. So many people have said to me over the years “When can I come and have a go”, “I’d love to try my hand at that”, “I loved metalwork at school”, I felt it high time that I met demand! My wife Dawn, runs chocolate workshops from the summerhouse at the end of our garden in Hitchin – so if one of you would prefer chocolate to metal – please see details of her courses here. When I’m not at the forge I’m spending time with my family – and whenever I get the chance, I jump on my road bike for a decent ride in the lovely Herts countryside!